"Family & Pet Friendly Park on Water & Sewer too!" Bedrooms: 2 "At opposite ends for maximum privacy"
Bathrooms: 2 "Both 4 piece Bathrooms"
Garage: "Open Parking for 2. RV Parking within Park"
Size: 1,190 sq. ft. "Originally Single-wide with Large Addition"
Economical Living with Lots of Space. Located on the Sunny Keremeos Upper Bench in the K-Mtn Mobile Home park which is one of the only parks on both Municipal Water & Sewer. No age restrictions and Pets are allowed with onsite Park Manager's approval. 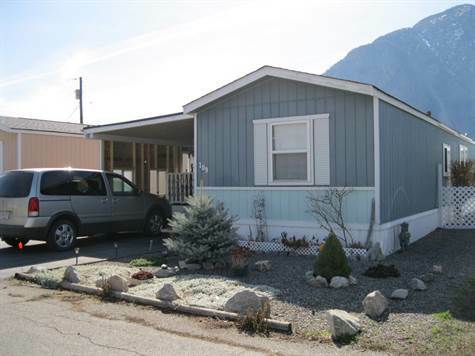 Walking distance to Keremeos shops and high school. Originally a single-wide, this 1992 home was tastefully extended and now provides a roomy 1190 sf of living space. The 2 bedrooms and 2 full bathrooms are at opposite ends of home to maximize privacy for family or guests. The floor plan is very flexible - your could switch the living room and dining rooms should you prefer to have the cozy gas fireplace/stove in the living room. In that case, you could have a large dining room adjoining the kitchen. There's an insulated multi-purpose 17 x 11 Family and/or Hobby Room accessible from 2 interior rooms and it has an exterior door to the 2 large storage sheds out back. Anyone with bikes will appreciate the ability to park bikes in the shed with the ramp because you can exit the park via the back lane. Home has Central Air and Gas Furnace (2016). Parking out front for 2 cars. RV parking area within Park on space available basis $10/mo. Price includes all appliances. And, the portable dishwasher freezer, 2nd fridge & some furniture may be negotiable. Pad rent of $473/mo includes water & sewer. Note: At owner's request, no signage on property & showings after 10:00 am preferred. Schedule your viewing appointment soon and live your dreams in the beautiful Similkameen Valley.